The 2018 Wimbledon promotional video is evidence that the 140-year-old tournament is adamant on getting the “art" right. To start with, it’s called In Pursuit Of Greatness: Take On History. The animated digital film showcases the evolution of the tournament dating back to 1877. “The attitude is to innovate, to preserve the tradition, so they don’t have to play off each other," says Alexandra Willis, head of communications, content and digital, at the All England Lawn Tennis & Croquet Club (AELTC). “Wimbledon’s mission statement is to maintain its position as the pinnacle of the sport and everyone recognizes that going digital and using technology is an important window for the outside world, especially those who don’t have the opportunity to be here," Willis says over the phone. The elite major, initially known for its documentary-style content, has moved slowly to quirky, snackable content on the internet. The last couple of years have seen it pick up speed and humour on social media, and, in 2017, it took the “gruntometer" technology to a new level. “Last year, we brought in AI (Artificial Intelligence) highlights and this year we are expanding on that. IBM’s Watson will recognize three main features—player gestures, the crowd noise and excitement level, and also key moments in the match. It overlays all of it to reveal the most interesting moments," Willis adds. Watson, the IBM supercomputer which combines AI and data-analytical software to operate as a question-answer machine, identified these key moments and stitched them together on its own. In 2018 too, the highlights you see on Wimbledon.com will be AI generated; however, Watson is getting a little smarter with each passing year. “Watson also provides us with tools to help process our content, such as photo production, and also a personalized assistant, or chatbot. But we always need to make sure that we are developing the technology to be smarter to fit the tennis and not the other way around. For example, last year, when we introduced the AI highlights, it was picking up players gesturing for a towel, rather than a celebration. So we have to keep refining it," says Willis. 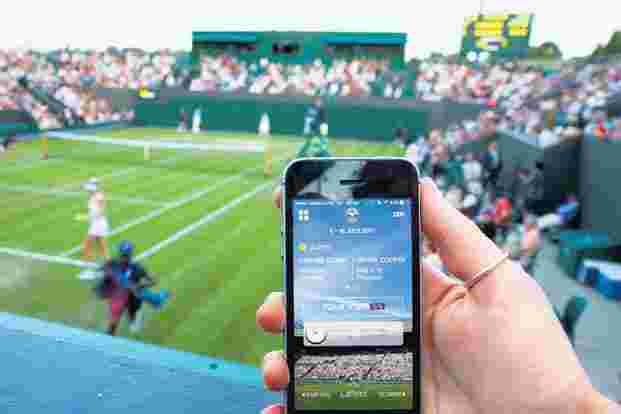 While Wimbledon.com won’t be streaming the matches, it will do all it can to be a compelling second screen during the action, with its point-by-point scoring and data-driven analysis. “One of the specific aspects we have reimagined is the IBM SlamTracker, which helps fans understand the key moments in the match. It draws upon over 10 years of data points when a certain player plays or takes on another player, and it will indicate these decisive moments and provide context around them," Willis explains. Having worked at the AELTC for eight years, Willis is most excited about the rebuilding and redesigning of Wimbledon.com, which will feature a new level of personalization. “As we gear up for full personalization, user control is important. This year, users can choose their favourite players and get alerts. Next year, we will enhance that. It is still early on in the journey. I’d say one-two years (for full personalization), and we have to be aware of how ready consumers are. We recognize we have a varied fanbase of different people from different parts of the world, so we are working towards new ways to allow fans more control over what they are consuming." While AI, personalization and data analysis are clearly areas Wimbledon continues to invest in, virtual reality (VR), as in most places, continues to be just an experiment. “We used 360 and VR for practice matches last year and highlights of the two singles finals, just to understand the appetite for it, and it’s quite high. But we don’t yet know if it will fully transfer to live tennis. While the aim is to communicate what it’s really like to be at Wimbledon, we don’t know how comfortable it is to consume VR for a five-set match over 3 hours," Willis says. As Wimbledon continues to spread its machine-learning wings, clipping the focus on content is not an option—it has, in fact, to be enhanced. “Technology provides the tools to serve better content. There are hundreds of matches, and, with consumers asking for more, it is important to stay on top of the challenge." As we watch the traditional major evolve tastefully, is it safe to say that the rigid tag is far behind it? Or will it need to sell tickets online for that (which Wimbledon famously does not do)? “We do make our tickets available online to our fans around the world via The (overseas) Public Ballot," says Willis.